José Guadalupe Posada, Grabados de José Guadalupe Posada, Calavera Catrina, Grabado, 11.1 x 16 cms. Anyone who has been to Mexico around the Day of the Dead festivities on November 2 has encountered many smiling, dancing skeletons. The skeletons come in many forms, from life-sized sculptures of merry ghouls to fiendish monsters in paintings and prints. Some calaveras (or skulls) can be eaten. They come in various sizes, are very sugary, and are often used to decorate elaborate Day of the Dead altars, along with oodles of marigolds, photos of lost loved ones, and candles. These skeletal figures were used to great effect by the late Mexican artist José Guadalupe Posada (1852-1913) in his political cartoons published in various newspapers. The cartoons often poked fun at the foibles of politicians. One such politico, Jesus Gomez Portugal, was the regional chieftain of the city of Aguascalientes and became so incensed with Posada’s satiric cartoons that he banished the artist from the city in 1871. Posada moved to Leon and later to Mexico City. A large exhibition of Posada’s prints has opened at the UNAM building in downtown Hull at 55, promenade du Portage. UNAM is the acronym for Universidad Nacional Autonoma de Mexico, the large multi-campus university based in Mexico City. The UNAM branch in the Hull sector of Gatineau is best known for the teaching of Spanish as a second language. Posada’s prints begin in a second floor hallway and continue onto the walls of a large meeting room. You know you have hit the right spot when you see the elegant, skeletal “catrina” figure standing on the floor. Nearby on the wall is Posada’s “La Calavera Catrina,” a print created from a zinc plate in the early 20th century. 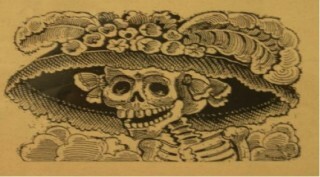 The image shows a female skeleton’s head dressed in the kind of ostentatious hat popular with Mexican women in those days who identified more with Europe than Mexico. 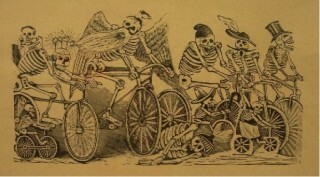 José Guadalupe Posada, Grabados de José Guadalupe Posada, Calaveras Ciclistas, Grabado, 14.5 x 26 cms. This satiric image of Mexican women denying their own heritage has become one of the most iconic artworks in Mexico. It is reproduced endlessly during the Day of the Dead festivities, which have a habit of starting a few days before November 2 and carrying on for a few days afterward. There is, in fact, an entire industry built around reproductions of La Calavera Catrina. Some of the 3-D versions are very elaborate, come in varying sizes, wear a dizzying array of costumes and sell for prices in the hundreds of dollars. A couple can be found in my home. As a regular visitor to Mexico, I am constantly battling the urge to buy more. There is much more to the Posada exhibition than skulls and catrinas, although many of the prints require a certain knowledge of Mexican history and politics to understand fully. But even if you don’t always get the joke, you can appreciate the craftsmanship behind the prints. Posada’s work has often been compared to that of Francisco de Goya, whose etchings from the Napoleonic Wars in Spain comprise some of the most gruesome and haunting war art ever created. Actually, I see Posada’s work more akin to that of French artist Honore Daumier whose drawings and cartoons famously skewered French politicians during the 19th century. The Posada exhibition continues at UNAM until March 15. There is no admission charge. Visitors are welcome from 9 a.m. to 7 p.m. Monday to Thursday and from 9 a.m. to 6 p.m. Friday.